Star Wars: Episode II had a pretty big job. After Phantom Menace was met with derision, Lucas had to write a sequel that brought back a level of maturity and excitement to the franchise, without alienating younger fans. He also sought to begin lining up the events of the prequels with the backstory from the original trilogy. He failed, on both parts, but Attack of the Clones is still probably the most watchable of the prequel trilogy, and certainly the most interesting to discuss. Attack of the Clones is at its best when it does what we love about the original Star Wars films: it recontextualizes elements of classic pulp or movie serials in new and inventive ways. The entire Obi-Wan subplot, in which he investigates a bounty hunter and stumbles into a mysterious conspiracy, is clever and unlike anything Star Wars had ever done. It echoes noir beats well, while expanding and fitting them to the universe. Obi-Wan meets up with one of his street-level contacts, a diner cook named Dex, but the “streets” are floating skyways on the planet Coruscant and Dex is a four-armed reptilian alien. It’s raining when he tracks his adversary, Jango Fett, to the planet Kamino, but because it’s Star Wars, it’s a watery planet with constant storms. It’s a set of tropes we recognize, but they’re presented in a new way, bringing a new angle to both the noir concepts and the Star Wars universe. The action sequences work the same way, though less effectively. The opening confrontation and chase scene with Zam Wessell is homages from spy movie fare (Zam’s use of poisonous centipedes in Padme’s room screams Bond villain, as does Jango’s assassination of Zam before she can implicate him) to a neon, flying car cityscape that’s somewhere between The Fifth Element and Blade Runner. Showing us the seedy, dangerous parts of Coruscant just one movie after a minor character reverently muses “the entire planet is one big city” is a good save by Lucas. Likewise, the film’s climax is a solid gladiatorial set piece that homages old serials, but it also feels like gilding the lily after Return of the Jedi. 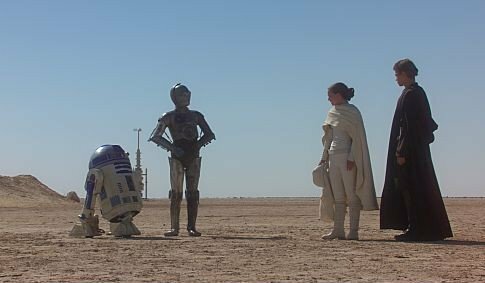 Whereas the RotJ characters were compellingly confident in the face of likely death, Attack of the Clones’ leads are constantly despairing, even though we as an audience know they’re safe from the original trilogy. There are three monsters here instead of one, sure, but it’s diminishing returns. Similarly, we get C-3PO being thrown around on the battle droid assembly line, a scene ostensibly recalling the bits with him being taken apart in Empire Strikes Back, but with even less subtlety. Sometimes less is more! The weakest parts of Episode II are, well, everything else. Hayden Christensen and Natalie Portman don’t have an ounce of chemistry, and their romantic dialogue feels like it was written by an early 2000s text reply bot. Their love story, which should be a pivotal moment for the trilogy, becomes a series of cringey scenes the audience spends looking at their watches. There’s also so much needless origin material for stuff we’re already familiar with, which actually hurts the original series. Boba Fett is a cool-looking bounty hunter who growls and stands menacingly before meeting an ignominious death. What does seeing him as a ten-year-old kid with a bad haircut bring to the character? Yoda is unassuming, but full of hidden power and wisdom. Why does he need to have a lightsaber at all? What does it do for his story, besides look silly? Between the Gungans and podracing and the fold-up droid army, The Phantom Menace is pretty disparate from the original series. Lucas’ attempt to line up the inferior universe he’s created for these new films is almost worse. At least most of Episode I is unnecessary fluff, in the context of the larger narrative. I know everyone’s tired of “how I would fix the prequels” essays, but it’s just crazy how there’s a part of a good movie rattling around inside of Attack of the Clones. If Lucas had cared less about showing how everyone got to where they are in A New Hope and more about just telling a cool story, we’d be much better off. Make it all noir! Put the Clone army in the middle and pull Jango Fett as their progenitor out as a twist! Don’t even worry about Anakin and Padme since we already know they get together! Focusing on specific subgenre stuff is a nice way to broaden the stories, and I’m glad Rogue One and other new standalone films seem to be heading that way. In the end, Attack of the Clones is a film where we endure a lot of really stupid stuff to get to some enjoyable ideas or visuals. It’s dumb that the Clone army is a bunch of copies of Boba Fett’s dad in a convoluted conspiracy I still don’t really understand BUT Yoda and Mace Windu showing up on Clone gunships like helicopters in Vietnam is a cool image. Anakin’s arm getting chopped off in the final duel is an unnecessary rip-off of Empire Strikes Back BUT his metallic, skeletal prosthetic in the final shots is a nice foreshadowing of Darth Vader. Underneath the pointless homaging and clunky love story, is an interesting expansion of the Star Wars universe. There’s just so much chaff in there with the wheat.